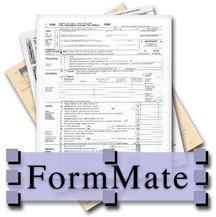 FormMate™ enables you to fill out pdf files on your computer. It is a very simple process to open up a pdf, add text data to the pdf, add any image files that you need (an image of your signature, a check mark...), and print, fax or save the filled in pdf to disk. FormMate™ "references" the pdf. It does not modify the pdf in any way. Full support for Spotlight, Apple Computer's searching technology. "QuickCells", a great new way to quickly and easily add text and images that you often need in your documents (your name, address, signature, check boxes...). Continuous Scrolling mode allows you to quickly view your whole document. FormMate™ automatically checks for updates at startup (you can disable this feature if you wish), and can automatically download the newer version if one is found. This keeps you up-to-date with the latest version. FormMate™ is very inexpensive ($21.99) for what you get. You are welcome to download an unlicensed version to try it out. The unlicensed version has the full functionality of the licensed version, but does place a watermark over the document. This watermark disappears once you purchase and register FormMate™ (by simply entering a valid registration key), or purchase FormMate™ from Apple's App Store .